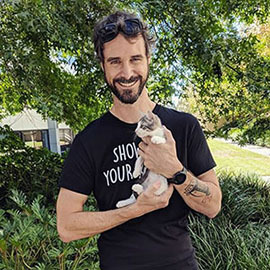 Crazy Cat Lady Queensland (ABN: 93 160 581 452/CH3113) is a registered charity that was founded in 2017 to address the sharp increase in cats and kittens being given away and abandoned in QLD during the Christmas holiday period, which coincides with mating season. 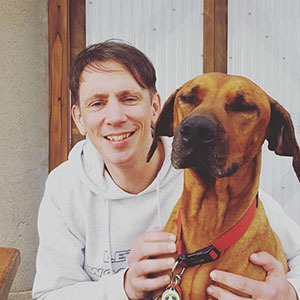 We are a no kill, ethical rescue whose main purpose is to reduce unnecessary euthanising of healthy animals. We do not rescue based on temperament, breed, age or colour. As of April 2018, we also rescue canines and provide the same quality care, vet treatment & training as we do to our felines. We understand that sometimes things just don't work out and offer lifetime support & return for all cats and dogs adopted from us. If returned within 14 days of adoption, we will refund the adoption fee, minus a $20 admin fee. The adoption fee covers vaccinations, microchips, desexing, as well as flea and worm treatments. We reserve the right to reject an application at any stage and will inform you if and why this happens. Cotton tail might seem a bit skittish on first meeting but he’s adorably silly once he’s comfortable. He does everything he can to get you to pay attention to him, like rolling around on the floor, tapping your leg, climbing anything he can to be in your line of sight, etc. He’s a playful kitten and loves toys, cat caves and boxes. He also enjoys snuggling up with his humans and being cradled like a baby in his downtime. If you’re looking for a cat who will sleep with you, then Cotton tail is your boy! He’s currently living with other cats and dogs with no dramas. His play style is a tad too rough for most cats but he doesn’t mind getting licks and cuddles from dogs. Cotton tail is currently in Caboolture. Please send us a message if you’d like to meet him! 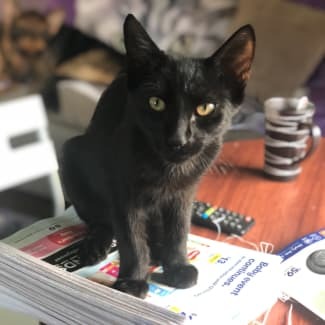 Salem is the type of cat who purrs as soon as he sees you. He LOVES attention and will happily accept pats from complete strangers. He’s one of the few cats who actually like being picked up and smooched. He plays well with other cats and simply purrs when he’s licked by dogs that he knows. Salem is currently in Caboolture. Please send us a message if you’d like to meet him! 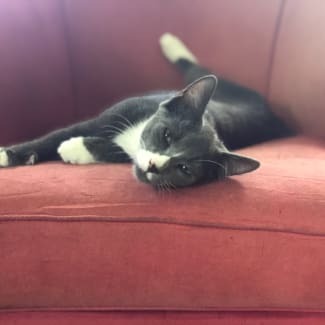 Gin is a quirky boy who has proclaimed himself the top cat in the clowder. He’s always the first one to try out anything new, be it boxes, beds or toys, and he goes absolutely insane if he likes them! We’ve nicknamed him the Naughty Box because he likes to flip a box over his body and pounce on unsuspecting victims. He absolutely loves playing with other cats, regardless of whether they like him or otherwise. He’ll even take on dogs of all sizes when he’s in the mood. He is a very entertaining cat to watch and is guaranteed to give you plenty of giggles! Crazy zoomies are not the only thing Gin has to offer, he’s also a big spooning enthusiast. He’s used to having a regular bedtime and will patiently wait for his humans in bed. He likes snuggling up under the covers and purring away in your arms. Gin is currently in Caboolture. 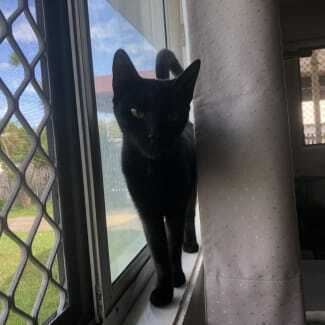 Please send us an enquiry or email crazycatladyqld@outlook.com if you’d like to meet this cutie! 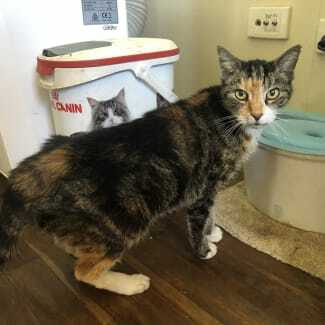 Rainbow may seem cranky in all her photos but she’s actually a sweet girl who will quietly walk up to you for pats and is happy to receive attention even when she doesn’t ask for it. She’s one of the few who will actually come out of hiding and approach strangers when we have guests over. She seems to have had a rough life and her body has aged poorly, but with love and care she will flourish. It helps that she’s not a fussy eater at all and has a very healthy appetite 😉 She’s quite stressed in her current living environment so we are looking for a quiet foster or forever home for this little lady. She’s not too keen on super friendly young cats and dogs but doesn’t mind other equally independent cats. Rainbow is currently in Caboolture. 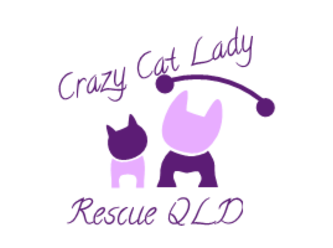 Please send us a message or email crazycatladyqld@outlook.com if you’d like to meet her! 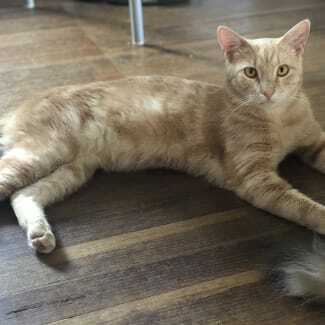 Saffron is a shy girl who takes about a week to warm up to new people and strange new environments. Once settled, she enjoys exploring every nook and cranny and is happy to be picked up and cuddled. She enjoys watching the scenery and you’ll often find her perched on a windowsill. She currently lives with other cats and dogs and does not mind them.